Health Canada is taking its time to finalize their decision on whether the abortion pill should be accessible for Canadians. In fact, the regulator is more than doubling its ruling period for the drug, with the deliberation lasting over 700 days versus the standard 300. According to the Globe and Mail, a resolution is reportedly set for mid-January 2015. The medication in question is RU-486. 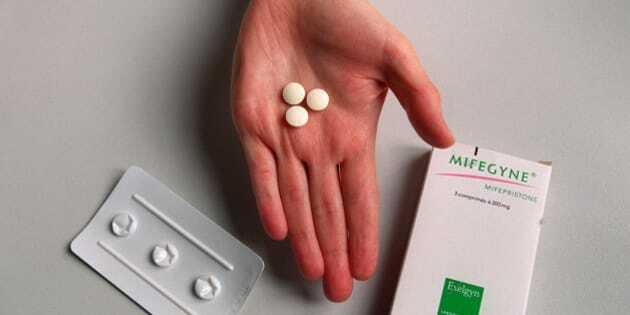 Also known as mifepristone, the drug is used with misoprostol — which is already legal in Canada — to terminate a pregnancy within the first nine weeks. The National Post reports RU-486 has been available in the U.S. since 2000 and France since 1998, and is prescribed by a doctor. In 2013, the Canadian Medical Association Journal dubbed it the "gold standard" in providing non-surgical abortions during the early stages of pregnancy, but that hasn't sped up the government's approval or disapproval process. “It is a very safe medication," said Dawn Fowler, Canadian director for the National Abortion Federation, to Canada.com. "It has received FDA (U.S. Food and Drug Administration) approval in the U.S. and more than 2 million women in the U.S. have used mifepristone to terminate pregnancies." Fowler also told the publication the mifepristone also carries "less intense" side effects than other medical abortions, and has an "extremely, extremely low" complication rate as seen in roughly 0.4 per cent of users. Two weeks after the medication is taken, the woman needs to visit her doctor for a check-up to ensure the abortion was conducted safely and effectively. Currently, non-surgical abortions are available nationwide with a drug named methotrexate, though RU-486 is widely considered to be safer. These options also provide opportunities for pregnancy termination for those who may not have access to the morning-after pill, or an abortion clinic. Rural access to surgical abortions remains a contested debate across the country. In Prince Edward Island, the government pays for these physical services, but despite the pleas of local lobbyists, abortions are not performed in the province. Instead, women typically drive three-and-a-half-hours to Halifax for the procedure, which Wendy Norman — the chair in applied public health for both the Canadian Institutes of Health Research and the Public Health Agency of Canada — insists is less of a commute than what other Canadian women face in a similar situation. In Newfoundland and Labrador, CBC News reports abortions are only available in the provincial capital of St. John's. But, RU-486 is not without its detractors. Mary Ellen Douglas, national organizer for the anti-abortion Campaign Life Coalition, told CBC News earlier this year that "it's just not something that should be brought into Canada." "It is abortion ... and of course we wouldn't want it for that reason." Health Canada has not released any details regarding its lengthy deliberation about the drug's legality. Manufacturer Linepharma International originally filed its new-drug submission for RU-486 in Oct. 2012, and has already beaten the existing consideration record, which was 644 days as per the Globe and Mail.